"Gaydar Aliev" redirects here. For other uses, see Gaydar (disambiguation). Heydar Alirza oglu Aliyev (Azerbaijani: Heydər Əlirza oğlu Əliyev, [hejdær ælirzɑ oɣlu ælijɪf]; Russian: Гейда́р Али́евич Али́ев, translit. Geydar Aliyevich Aliyev, [gʲɪjˈdar ɐˈlʲiʲɪvɪtɕ ɐˈlʲiʲɪf]; 10 May 1923 – 12 December 2003) was an Azerbaijani politician who served as the third President of Azerbaijan from October 1993 to October 2003. As national president he held constitutional powers, but his influence on Azerbaijani politics had begun years earlier. As a young man he had joined the Azerbaijan SSR People's Commissariat for State Security (NKGB) and quickly rose to the rank of Major-General. The regime established by Heydar Aliyev in Azerbaijan has been described as dictatorial or authoritarian  and repressive. Political commentators highlight that Aliyev ran a heavy-handed police state, that he rigged elections and muzzled the media whereas others emphasize that his balanced policy brought stability to Azerbaijan. According to his website, he was born in Nakhchivan City. After graduating from Nakhchivan Pedagogical School, from 1939 to 1941 Aliyev attended the Azerbaijan Industrial Institute (now the Azerbaijan State Oil Academy), where he studied architecture. In 1949 and 1950, he studied at the USSR MGB Officer Corps Qualifications-Raising School. Aliyev's official biography also stated that he studied at Baku State University, graduating with a degree in history in 1957. According to American journalist Pete Earley, Aliyev first attended the Ministry of State Security Academy in Leningrad, graduating in 1944. He also attended senior staff professional development courses at the Dzerzhinsky Higher School of the KGB in Moscow in 1966. In 1948, he married Zarifa Aliyeva. On 12 October 1955, their daughter Sevil was born. On 24 December 1961, their son Ilham was born. Zarifa Aliyeva died of cancer in 1985. Heydar Aliyev served at the Archive Department of the People's Commissariat of Internal Affairs of the Nakhchivan Autonomous Soviet Socialist Republic from 1941 to 1944, before his appointment to the head of General Department of the Council of People's Commissars of the Nakhchivan ASSR. H. Aliyev joined the Azerbaijan SSR People's Commissariat for State Security (NKGB) in 1944. 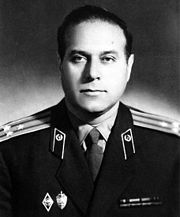 He proceeded to became the department head of State Security Committee of Azerbaijan SSR in 1950, after he graduated from Senior Staff Training School of the USSR State Security Committee. In 1954, as part of a government reform, NKGB became known as Committee for State Security, or the KGB. Aliyev rose quickly through the KGB ranks, becoming a deputy chairman of the Azerbaijani KGB in 1964, its chairman in 1967, and eventually reaching the rank of major general. Aliyev was elected First Secretary of the Central Committee of the Azerbaijan Communist Party at its Plenary Session held on 12 July 1969, amidst a Soviet anti-corruption campaign. Aliyev made some progress in the fight against corruption: a number of people were sentenced to prison terms; and in 1975, five factory and collective farm managers were sentenced to death for gross corruption. In the early 1980s, Aliyev barred the offspring of certain legal personnel from attending the Republic's law school, in a purported effort to curb a self-perpetuating elite based on corruption. In 1977, he visited Iran: Mashhad twice and Kerbala once. During the period of his leadership of Soviet Azerbaijan, Aliyev's efforts led to considerably increased economic, social and cultural growth rates in Azerbaijan SSR. Aliyev became perhaps the most successful republican leader, raising the profile of the underprivileged republic and consistently promoting Azerbaijanis to senior posts. On 22 November 1982, Yuri Andropov promoted Aliyev from candidate to full member of Soviet Politburo and appointed him to the post of First Deputy Chairman of the Council of Ministers of the USSR, responsible for transportation and social services. Aliyev thus attained the highest position ever reached by an Azerbaijani in the Soviet Union. Aliyev was forced to resign from this position in 1987 amidst allegations of corruption made against him by Mikhail Gorbachev. Despite that, CIA report states that, Heydar Aliyev became First Deputy Chairman of USSR Council of Ministers and a full Politburo Member who publicly pledged to fight against corruption, free key state personnel and the economy of the Soviet Union from bribery. It is noted in the report that his colleagues understood his intention to deal harshly with corruption was serious and his commitment to the anti-corruption became his trademark within the Soviet Union. Aliyev in his KGB uniform. As head of the KGB's branch in Azerbaijan, Aliyev ran an anti-corruption campaign. Following the campaign, he became the undisputed leader of Azerbaijan. Aliyev became a candidate (non-voting) member of the Soviet Politburo in 1976. He ran this position until December 1982, when Yuri Andropov promoted him to the office of First Deputy Chairman of the Council of Ministers. Heydar Aliyev also served at the USSR Council of Ministers as the first deputy chairman in 1974-1979. His star waned following his appointment in 1985 under Mikhail Gorbachev. His political views became something of a liability to him in the era of perestroika, but he still exerted tremendous power in Azerbaijan. After his forced retirement in 1987, Aliyev remained in Moscow until 1990. He suffered a heart attack during this time. Aliyev appeared in the Permanent Mission of Azerbaijan SSR in Moscow, demanded that the organizers and executors of the crime committed against the people of Azerbaijan be punished for a military action which resulted in violent Black January events amidst the brewing Nagorno-Karabakh War. Almost immediately after this public appearance in Moscow, Aliyev officially resigned his membership in the Communist Party of the Soviet Union and left Moscow for his native Nakhchivan. Here, Aliyev reinvented himself as a moderate nationalist and was subsequently elected deputy to the Supreme Soviet of Azerbaijan SSR in Baku. Under the pressure and criticism from the groups connected to his nemesis, the then-leader of Soviet Azerbaijan Ayaz Mutallibov, Aliyev again returned to Nakhchivan, where he was elected Chairman of the Supreme Soviet of Nakhchivan Autonomous Republic in 1991. By December 1991, when the Soviet Union ceased to exist and Azerbaijan formally became an independent state, despite Mutallibov's presidency Aliyev independently governed Nakhchivan. Early 1992 was marked by increased violence in Nagorno-Karabakh War with the fall of Shusha, the last Azerbaijani-populated town in Nagorno-Karabakh. These events resulted in the resignation of Mutallibov and the subsequent rise to power of the Azerbaijan Popular Front led by Abulfaz Elchibey. During Elchibey's one year in power, Aliyev continued to govern Nakhchivan without any subordination to the official government in Baku. The attempt by the Popular Front's Minister of Interior Isgandar Hamidov to forcibly overthrow Aliyev in Nakhchivan was thwarted by local militia at the regional airport. During the same period, Aliyev independently negotiated a cease-fire agreement in Nakhchivan with the then-President of Armenia, Levon Ter-Petrossian. 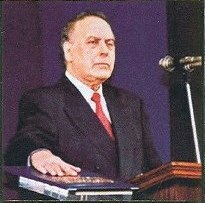 Heydar Aliyev was elected as the leader of New Azerbaijan Party at its the constituent congress organized in Nakhchivan on November 21, 1992. In May–June 1993, when, as a result of a crisis in the government, the country was on the verge of a civil war and faced the peril of losing independence, the people of Azerbaijan demanded to bring Heydar Aliyev to power, and the then leaders of Azerbaijan were obliged to officially invite Heydar Aliyev to Baku. On 24 June 1993, amidst the advancement of insurgent forces under Huseynov's control towards Baku, Elchibey fled from the city to his native village of Keleki in Nakhchivan. Earlier, on 15 June 1993, Aliyev had been elected Chairman of the National Assembly of Azerbaijan, and after Elchibey's flight he also assumed temporary presidential powers. In August 1993, Elchibey was stripped of his presidency by the nationwide referendum, and in October 1993, Aliyev was elected President of Azerbaijan. In May 1994, Aliyev entered into a ceasefire agreement that still remains in force to this very day. However, the conflict remained unresolved, with Armenian control over Nagorno-Karabakh. On 3 October 1993, as a result of nationwide voting, Heydar Aliyev was elected President of the Republic of Azerbaijan. On 11 October 1998, having garnered at the elections, passed in high activeness of the population, 77 per cent of the votes, he was re-elected President of the Republic of Azerbaijan. Heydar Aliyev, giving his consent to be nominated as a candidate at the 15 October 2003 presidential elections, relinquished to run at the elections in connection with health problems. Strengthening the state independence, creating independent structures state, its attributes, ensuring the security, territorial integrity and sovereignty of Azerbaijan helping the country to end the war, improving the welfare of its citizens, creating the necessary conditions for their life and work will be basic directions in my activity as President and I will do my best to accomplish them...Putting my hand on the Constitution of Azerbaijan, I swear to devote all my knowledge, experience, efforts for the good deeds of the Azerbaijan people, for Azerbaijan. Just in front you, in front of all the citizens of Azerbaijan, I have taken the oath by putting my hand both on the Constitution of the Republic of Azerbaijan, and on the Holy Koran, I declare that I shall be always loyal to this oath and up to the end of my life, truly serve our native Azerbaijan, our nation and our people. The Government under Aliyev's leadership carried out legal, political and economical measures between 1993 and 2003. Further, Commission for Legal Reforms was established, in 1998 capital punishment was abolished. The institute of the Human Rights Ombudsman was established, amnesty and pardon mechanisms were introduced. Simultaneously, the comprehensive economic reforms including the agrarian reform were carried out; the state property privatization was initiated; the industrial and agricultural crises were lifted. Constitutional Commission was assembled by Heydar Aliyev in June 1995 in order to substitute 1978 Azerbaijan SSR Constitution. The first draft was ready in October for public debate and the final version composed of 5 chapters, 12 sections and 147 articles, was confirmed according to results of popular referendum held on November 12, 1995. As a result, separation of power was provided among 3 divisions: legislative (Milli Majlis), executive (President) and judicial (courts). President Heydar Aliyev suggested amendments to the Constitution of Azerbaijan in June 2002. First amendment to the Constitution of Azerbaijan was approved as the result of referendum took place in August 2002. Consequently, 39 amendments to 23 articles of the Constitution of Azerbaijan were made, proportional party list elections to Parliament was abolished; transferring presidential power to Prime Minister instead of Chairman of Milli Majlis in case of resignation of President was confirmed; simple majority was preferred in the procedure of calculating the results of presidential elections; citizens, courts and Ombudsman of Azerbaijan received right to appeal directly to the Constitutional Court of Azerbaijan. Heydar Aliyev requested elimination of death penalty on 3 February 1998. On his speech addressed to Milli Majlis, Aliyev stated: "I am convinced that the abolition of the death penalty is a crucial step in the humanization of criminal justice policy, moreover it is an important stage in the reform of the legal system as a whole". “Taking into consideration all the facts, I am submitting a draft law on amendments and additions to the Criminal, Criminal-Procedure and Corrective Labour Code of the Republic of Azerbaijan regarding the abolition of the capital punishment in the Republic of Azerbaijan in accordance with Article 96 of the Constitution of the Republic of Azerbaijan for the discussion.” Milli Majlis approved the draft law, so on 10 February 1998 the “Law on Amendments and Additions to the Criminal, Criminal-Procedural and Corrective Labour Code of the Republic of Azerbaijan regarding the elimination of the death penalty in the Republic of Azerbaijan” was adopted. As a result, capital punishment was replaced with life imprisonment. Azerbaijan joined “Second Optional Protocol to the International Covenant on Civil and Political Rights, aiming at the abolition of the death penalty” on 22 January 1999. Heydar Aliyev issued a decree on “Measures for Ensuring Human and Civil Rights and Freedoms” on February 22, 1998. State Program on "Protection of Human Rights" was confirmed by the Presidential Order dated 18 June 1998. Ombudsman institution in Azerbaijan was established based on this State Program and commitments before CoE according to the Constitutional Law “On the Commissioner for Human Rights (Ombudsman) of the Republic of Azerbaijan” adopted on 28 December 2001 and Presidential Decree dated 5 March 2002 on implementation of this law. Elmira Süleymanova was appointed as the Commissioner for Human Rights (Ombudsman) among 3 nominees requested by later President Heydar Aliyev according to the Decision No. 362 of the Milli Majlis on July 2, 2002. 1995-1997 - At the first stage the legislative base for agrarian sector was reestablished with adopting a number of legislative documents. Privatization of agriculture of Azerbaijan with dissolving the traditional collective and state farms was in the center of these laws, as the Law on “the Basis of Agrarian Reform” (18 February 1995); “Reform of state and collective farms” (18 February 1995);“Land Reform” (16 July 1996). On 10 January 1997 Heydar Aliyev issued a Decree on “Approval of some legal documents assuring implementation of agrarian reforms”. State Commission on Agrarian Reforms was formed by the Decree of Heydar Aliyev dated 2 March 1995. 1998-2001 - At the second phase the main attention was paid to post-privatization support and removing bureaucratic barriers to implement these reforms more effectively. Ministry of Agriculture was reorganized by presidential decree dated 6 June 1998 (On Ratification of the Statue on the Ministry of Agriculture), the law on “State land cadaster, land monitoring and structure” (22 December 1998), decree on “Land rent” (12 March 1999), law on “land market” (7 May 1999) was adopted, moreover The Land Code of Azerbaijani Republic was approved by the Law on “Approval of Land Code of the Republic of Azerbaijan” dated 25 June 1999. A meeting between Heydar Aliyev with Vladimir Putin in Kremlin on 25 January 2002. During the presidency of Heydar Aliyev, foreign policy of Azerbaijan was rebuilt and transformed into balanced policy. The bilateral relations between Azerbaijan and other countries, as well as cooperation with international organizations, started to deepen. Relations with United Nations. Azerbaijan began actively participating within the international organizations such as United Nations. Heydar Aliyev attended 49th session of UN General Assembly in 1994, in the special session of UN GA dedicated to 50th anniversary of United Nations in October 1995. He received former Secretary General of UN Boutros Boutros-Ghali in October 1994 in Baku. H.Aliyev met with Kofi Annan during his trip to USA in 1997 July. Heydar Aliyev addressed the Millennium Summit of UN held in September 2000 where he mentioned about Armenian invasion of Nagorno-Karabakh and adjacent regions, UN resolutions (822, 853, 874, 884) demanding unconditional withdrawal of the Armenian armed forces from the occupied Azerbaijani territories. After 11 September attacks, Azerbaijan joined anti-terror coalition of UN and cooperated with Office of Counter-Terrorism and Sanctions Committee of the UN SC. In October 2001, Azerbaijan joined International Convention for the Suppression of the Financing of Terrorism adopted by UN SC in 1999. Relations with NATO. Partnership for Peace (PfP) Framework Document was signed to enhance security and defense cooperation with NATO on May 4, 1994. Aliyev approved PfP Presentation Document on April 19, 1996. In November 1997, Azerbaijan joined the PfP Planning and Review Process. Azerbaijan became an associate member of due to the decision of NATO PA in November. Relations with EU. The Partnership and Cooperation Agreement came into force on June 22, 1999 which was signed in Luxembourg between the European Union and the Republic of Azerbaijan on cooperation in the field of trade, investment, economy, legislation, culture, immigration and the prevention of illicit trade on April 22, 1996. Azerbaijan received assistance from EU for the economic reforms in the country through TACIS and TRACECA programmes. “Restoration of the Historic Silk Road” international conference was organized in Baku on 8 September 1998 with the support of EU TACIS and TRACECA programmes based on the initiative of later presidents Heydar Aliyev and Eduard Shevardnadze. Relations with Council of Europe. Azerbaijan participated as a specially invited guest at the Council of Europe on 28 June 1996. Consequently, a number of resolutions and legal acts were adopted in 1996-2001 in order to improve legislative system of Azerbaijan to meet the requirements of European standards and international law. On 28 June 2000, Azerbaijan's admission to CoE as a full member was recommended at the session of PACE and Azerbaijan became the member a full member of CoE on 17 January with the official ceremony conducted on 25 January 2011. Presidential orders “On the implementation of the measures of the program of cooperation between the Council of Europe and the Republic of Azerbaijan” (July 8, 1996), "On the measures of Deepening Cooperation between the Council of Europe and the Republic of Azerbaijan" dated 20 January 1998, “On the measures of expanding cooperation between Azerbaijan and CoE for defending interests of the Republic of Azerbaijan in Council of Europe" dated 14 May 1999 were adopted by Heydar Aliyev. Relations with Russia. Heydar Aliyev gave importance to establish warmer relations with Russia than the previous leadership of Azerbaijan did. He stated in his speech at Milli Majlis on June 15, 1993 after being elected as the head of Parliament of Azerbaijan: "Russia, our northern neighbor, is absolutely a vast state. Undoubtedly, the relation based on independent principles between Azerbaijan and Russia must be better, broader and more fruitful". The Agreement on Friendship, Cooperation and Mutual Security between Russia and Azerbaijan was signed on July 3, 1997. Heydar Aliyev paid his first official trip to Russia as a President of the Republic of Azerbaijan in July 1997 with the invitation of the President of Russia Boris Yeltsin. The relations with Russia developed further through Aliyev-Putin negotiations during their bilateral visits (Vladimir Putin visited Azerbaijan in 2001 and Heydar Aliyev paid reciprocal visit to Russia in 2002). The Agreements on “The Status and Benefiting Principles of Gabala Radio Location Station”, “Long term economic cooperation agreement between Russian Federation and Azerbaijan Republic until the year 2010”, as well as “The common declaration of the President of the Russian Federation, Vladimir Putin and President of the Republic of Azerbaijan, Heydar Aliyev” were signed in the latter meeting. Relations with US. Establishing closer relations and developing cooperation with USA was among the main directions of the foreign policy of the former President of Azerbaijan Heydar Aliyev. He stated in one of his speeches regarding this issue: “The relations of Azerbaijan with the United States are important as we need to learn the Western democracy, culture, achievements, to benefit from them, to use and apply them in Azerbaijan. In this regard, the United States is a special country for us". The relations between these two countries began to strengthen after oil contracts were signed between them as a result of Heydar Aliyev's oil strategy. Heydar Aliyev paid his first official visit to USA and met with President Bill Clinton on August 1, 1997. They signed Joint Statement on future relations between USA and Azerbaijan in defense and military issues. During this trip (27 July-5 August 1997), the statement on intentions of formation of bilateral dialogue between the US and Azerbaijan regarding the energy issues, the general agreement between the Government of the Azerbaijani Republic, the National Bank and the U.S. Export-Import Bank on the promotion of projects were signed. Additionally, 4 agreements on development and production sharing for the Azerbaijani sector of the Caspian Sea were signed. Heydar Aliyev issued an order on “Measures to expand partnership relations between the Republic of Azerbaijan and the United States” on 2 September 1997 after the visit. Azerbaijan joined US-lead international coalition against terrorism after 11 September attacks, and sent a military contingent to Afghanistan. An amendment to the Freedom Support Act was adopted in 2002 (24 October) by the US Senate to allow the president of US to temporarily waive Section 907 which used to forbid to export any financial or humanitarian support to Azerbaijan. State Oil Fund of Azerbaijan was established by the Presidential Decree of Heydar Aliyev in December 1999 to gather the income gained from oil profit with the aim of financing social and economic projects.As a result of oil strategy developed by Heydar Aliyev, Azerbaijani oil was planned to be carried through different routes as Baku-Supsa, BTC and etc.In order to export Azerbaijani oil to the European market, the presidents of Azerbaijan, Georgia and Turkey agreed on constructing Baku-Tbilisi-Ceyhan pipeline in 1998 in Ankara. The ground-breaking ceremony of BTC took place in September 2002 with the participation of Heydar Aliyev, Ahmet Necdet Sezer and Edward Shevardnadze. To export Azerbaijani crude oil to the Novorossiysk port of Russia was decided by the contract signed in Moscow on February 18, 1996, transportation of oil through this route was realized in October 1997.Establishment of the alternative Baku-Supsa route was agreed on March 8, 1996, by Heydar Aliyev and Edward Shevardnadze. This route started to operate in April 1999. Aliyev's health began to fail in 1999, when he had a major heart bypass operation in the United States at the Cleveland Clinic. He later had prostate surgery and a hernia operation. He suffered a collapse while giving a speech on live television in April 2003. On 6 August Aliyev returned to the United States for treatment of congestive heart failure and kidney problems. He stood down from the presidency at the start of October 2003 and appointed his son Ilham as his party's sole presidential candidate. On 12 December 2003, President Heydar Aliyev died at the Cleveland Clinic. He was buried at the Alley of Honor cemetery in Baku. Ilham Aliyev duly won the presidential election of 15 October 2003 but international observers again criticized the contest as falling well below expected standards. This transfer of power became the first case of top-level succession in the former Soviet Union. Throughout his life, Heydar Aliyev was awarded a number of state orders and medals, international awards, elected honourable doctor of universities in many countries, including the Order of Lenin four times, the Order of the Red Star once and Hero of the Socialist Labor twice. On 27 March 1997 in Kiev, Ukraine, Aliyev received Ukraine's highest award, the Yaroslav Mudry Order, and on 13 April 1999, Turkey's highest honour, the Peace Premium of Atatürk Order. On 3 April 2003, he was elected a professor and authorized member of the Academy of Safety of the Russian Federation, and was subsequently awarded the Premium of Y. V. Andropov. On 10 May 2003, he was decorated with the Order of St. Andrew the Apostle the First-Called—Russia's supreme award. Russia: Order of St. Andrew (May 10, 2003) – "for his great personal contribution to strengthening friendship and cooperation between Russia and Azerbaijan"
Ukraine: Order of Prince Yaroslav the Wise, 1st class (20 March 1997) – "for outstanding contribution to the development of cooperation between Ukraine and the Republic of Azerbaijan and strengthening friendship between the Ukrainian and Azeri people"
^ a b "Heydar Aliyev biography". Archived from the original on 2007-09-13. Retrieved 2007-08-11. ^ Encyclopædia Britannica. Heydar Aliyev. Azerbaijani politician who, was one of the most powerful men in Azerbaijan for more than 30 years, as deputy chairman (1964-67) and chairman (1967-69) of the regional KGB, as secretary (1969-87) of the Communist Party of Azerbaijan, and from 1993 as the repressive and autocratic president of independent Azerbaijan. ^ "Heidar Aliev, maestro of the Caucasus". The Economist. 2000-08-31. ISSN 0013-0613. Retrieved 2017-09-03. "There is stability, because Mr Aliev is an acute tactician who runs a heavy-handed police state. Opposition leaders who decline to be co-opted are in jail, in exile or bullied. Elections are rigged, the media muzzled." ^ Kucera, Joshua (2008-05-20). "Travels in the Former Soviet Union". Slate. ISSN 1091-2339. Retrieved 2017-09-03. ^ Aslanli, Araz. "AZERBAIJAN-RUSSIA RELATIONS: IS THE FOREIGN POLICY STRATEGY OF AZERBAIJAN CHANGING?" (PDF). ^ "Biography". Heydar Aliyev Center. Retrieved 20 July 2015. ^ Earley, Pete (2008). Comrade J: The Untold Secrets of Russia's Master Spy in America After the End of the Cold War. Penguin Books. p. 200. ISBN 9781101207673. ^ a b c d e f "Heydar Alirza oglu Aliyev". en.president.az. Archived from the original on 2018-02-28. Retrieved 2018-02-28. ^ "Heydar Aliyev Foundation - Biography". heydar-aliyev-foundation.org. Retrieved 2017-04-01. ^ a b "CIA report on Geydar Aliev: His new role in the USSR Council of Ministers" (PDF). 24 January 2011. ^ a b Perkin, Harold James (1996). The Third Revolution: Professional Elites in the Modern World. Routledge. p. 204. ISBN 0415143373. ^ Block, Alan A. (1997). Masters of Paradise: A Postscript. Transaction Publishers. p. 325. ISBN 1560009713. ^ Azadian, Edmond Y. (2000). History on the Move: Views, Interviews and Essays on Armenian Issues. Wayne State University Press. p. 67. ISBN 0814329160. ^ United States Library of Congress Country Studies Azerbaijan - The Coup of June 1993. ^ İnternational Foundation on Election Systems (April 1994). Elections Today. 4 (Number 2-3). p. 28. ISSN 1073-6719. ^ "IFES Election Guide | Elections: Azerbaijan Pres Oct 11 1998". www.electionguide.org. Archived from the original on 2018-02-28. Retrieved 2018-02-28. ^ "Inauguration Speech of the President of the Republic of Azerbaijan Heydar Aliyev - Baku, "Republican" Palace, October 10, 1993". lib.aliyev-heritage.org. Archived from the original on 2018-04-09. Retrieved 2018-04-09. ^ "Presidential Elections in Azerbaijan". Azerbaijan International. Winter 1998 (6.4): 12–13. Archived from the original on 2018-04-09. ^ "Historical background to the document "Speech of the Azerbaijani President Heydar Aliyev in his Inauguration Ceremony (October 18, 1998)"". lib.aliyev-heritage.org. Archived from the original on 2018-04-09. Retrieved 2018-04-09. ^ "Speech of the Azerbaijani President Heydar Aliyev in his Inauguration Ceremony - October 18, 1998". lib.aliyev-heritage.org. Archived from the original on 2018-04-09. Retrieved 2018-04-09. ^ "The abolition of the death penalty and its alternative sanction in South Caucasus: Armenia, Azerbaijan and Georgia" (PDF). ^ @Nasir. "The Commissioner for Human Rights". /. Retrieved 2017-09-04. ^ "Azerbaijan". www.azerbaijan.az. Retrieved 2017-09-04. ^ Robert Elgie, Sophia Moestrup (2016). Semi-Presidentialism in the Caucasus and Central Asia. Palgrave Macmillan. p. 98. ISBN 978-1-137-38780-6. ^ Svante E. Cornell (2015). Azerbaijan Since Independence. Routledge. pp. 90–91. ISBN 9780765630025. ^ "Official web-site of President of Azerbaijan Republic - AZERBAIJAN » Constitution". en.president.az. Archived from the original on 2018-03-17. Retrieved 2018-03-17. ^ United Nations Public Administration Network. Nations in Transit 2003: Country Report of Azerbaijan (PDF). Archived from the original (PDF) on 2018-02-23. ^ ""Decision of the Central Election Committee of the Republic of Azerbaijan on the results of the referendum held on August 24, 2002 in order to make amendments to the Constitution of the Republic of Azerbaijan"". www.e-qanun.az. Archived from the original on 2018-03-17. Retrieved 2018-03-17. ^ "Address of the President of the Republic of Azerbaijan Heydar Aliyev to Milli Majlis on the ablotion of death penalty in the Republic of Azerbaijan". lib.aliyevheritage.org. Archived from the original on 2018-03-19. Retrieved 2018-03-19. ^ "Azərbaycan Respublikasında ölüm cəzasının ləğv olunması ilə əlaqədar Azərbaycan Respublikasının Cinayət, Cinayət-Prosessual və İslah-Əmək Məcəllələrinə dəyişikliklər və əlavələr edilməsi haqqında". www.e-qanun.az. Archived from the original on 2018-03-19. Retrieved 2018-03-19. ^ "Capital Punishment banned in Azerbaijan". Jamestown. Archived from the original on 2018-03-19. Retrieved 2018-03-19. ^ "United Nations Treaty Collection - Second Optional Protocol to the International Covenant on Civil and Political Rights, aiming at the abolition of the death penalty". Archived from the original on 2018-03-19. Retrieved 2018-03-19. ^ a b "Human rights". www.mfa.gov.az. Archived from the original on 2018-03-23. Retrieved 2018-03-23. ^ a b "History of establishment of the institution". www.ombudsman.gov.az (in Azerbaijani). Archived from the original on 2018-03-23. Retrieved 2018-03-23. ^ "Legal basis of the Commissione's activity". Archived from the original on 2018-03-23. Retrieved 2018-03-23. ^ "Decisions of the Milli Majlis on election of the Commissioner". www.ombudsman.gov.az. Archived from the original on 2018-03-23. Retrieved 2018-03-23. ^ "The Commissioner". www.ombudsman.gov.az. Archived from the original on 2018-03-23. Retrieved 2018-03-23. ^ a b Zvi Lerman, David Sedik (2010). Rural Transition in Azerbaijan. USA: Lexington Books. pp. 75–80. ISBN 9780739143186. ^ "Law on the Basis of Agrarian Reform of the Republic of Azerbaijan". www.e-qanun.az. Archived from the original on 2018-04-09. Retrieved 2018-04-09. ^ "The law of the Republic of Azerbaijan on Reform of state and collective farms". www.e-qanun.az. Archived from the original on 2018-04-09. Retrieved 2018-04-09. ^ "The law of the Republic of Azerbaijan on land reform". State Property Issues Committee of the Republic of Azerbaijan. Archived from the original on 2018-04-09. Retrieved 2018-04-09. ^ C. M. Hann (2003). The Postsocialist Agrarian Question: Property Relations and the Rural Condition. LIT Verlag Münster. p. 239. ISBN 9783825865320. ^ "Decree of the President of Azerbaijan on the formation of the State Commission on Agrarian Reforms". www.e-qanun.az. Archived from the original on 2018-04-09. Retrieved 2018-04-09. ^ "Decree of the President of the Republic of Azerbaijan on Ratification of the Statue on the Ministry of Agriculture". www.e-qanun.az - Ministry of Justice of the Republic of Azerbaijan - Single electronic base of normative legal acts of Azerbaijan (in Azerbaijani). Archived from the original on 2018-04-09. Retrieved 2018-04-09. ^ "Law on State land cadaster, land monitoring and structure". www.emdk.gov.az (in Azerbaijani). Archived from the original on 2018-04-09. Retrieved 2018-04-09. ^ "Decree on land rent". www.e-qanun.az. Archived from the original on 2018-04-09. Retrieved 2018-04-09. ^ "Law on land market". www.e-qanun.az. Archived from the original on 2018-04-09. Retrieved 2018-04-09. ^ "The Land Code of Azerbaijan Republic". www.e-qanun.az. Archived from the original on 2018-04-09. Retrieved 2018-04-09. 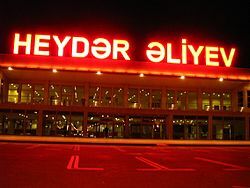 ^ Akyildiz, Selma (2014-01-18). "Azerbaijan Balance Policy in Heydar Aliyev Era (Between 1993-1995) - Akademik Perspektif". Akademik Perspektif. Archived from the original on 2018-02-28. Retrieved 2018-02-28. ^ "Azerbaijan - UN relations". mfa.gov.az (in Azerbaijani). Archived from the original on 2018-02-28. Retrieved 2018-02-28. ^ a b "Azerbaijani - United Nations relations". lib.aliyevheritage.org. Archived from the original on 2018-02-28. Retrieved 2018-02-28. ^ "Speech of the President of the Republic of Azerbaijan at the Millennium summit in New York - September 7, 2000". lib.aliyev-heritage.org. Archived from the original on 2018-02-28. Retrieved 2018-02-28. ^ "Overview of Azerbaijan-NATO Partnership". nato-pfp.mfa.gov.az. Archived from the original on 2018-02-28. Retrieved 2018-02-28. ^ "Key milestones of Azerbaijan-NATO Cooperation". nato-pfp.mfa.gov.az. Archived from the original on 2018-02-28. Retrieved 2018-02-28. ^ Azerbaijan-NATO 15 years of partnership (PDF). Mission of Azerbaijan to NATO. Archived from the original (PDF) on 2018-02-28. ^ "Azerbaijan and European Union". www.mfa.gov.az. Archived from the original on 2018-03-23. Retrieved 2018-03-23. ^ "Baku Initiative". www.traceca-org.org. Archived from the original on 2018-03-23. Retrieved 2018-03-23. ^ "Historical background to the document "The speech of the President of the Republic of Azerbaijan, Heydar Aliyev at the solemn ceremony of admission of the Republic of Azerbaijan to the Council of Europe (January 25, 2001, Strasbourg)"". lib.aliyevheritage.org. Archived from the original on 2018-04-09. Retrieved 2018-04-09. ^ a b "Azerbaijan - Council of Europe". lib.aliyevheritage.org. Archived from the original on 2018-04-09. Retrieved 2018-04-09. ^ Azerbaijan and Council of Europe (PDF). Baku: The Council on State Support to Non-Governmental Organization under the President of the Republic of Azerbaijan. 2009. ISBN 978-9952-442-26-7. Archived from the original (PDF) on 2018-04-09. ^ a b "Azerbaijan-Russia relations". Heydar Aliyev Heritage - international online library (in Azerbaijani). Archived from the original on 2018-05-01. Retrieved 2018-05-01. ^ "Speech of Heydar Aliyev, Chairman of the Supreme Soviet of the Republic ofAzerbaijan, at the meeting of the Parliament - June 15, 1993". Heydar Aliyev Heritage - International Online Library. Archived from the original on 2018-05-01. Retrieved 2018-05-01. ^ "Azerbaijan-Russia relations". moscow.mfa.gov.az (in Azerbaijani). Archived from the original on 2018-05-01. Retrieved 2018-05-01. ^ Aslanli, Araz (Fall 2010). "Azerbaijan-Russia relations: Is the foreign policy strategy of Azerbaijan changing?" (PDF). Turkish Policy Quarterly. 9: 137–145. Archived from the original (PDF) on 2018-05-01. ^ a b "Official visit of the President of the Republic of Azerbaijan Heydar Aliyev to the United States of America (July 27 - August 6, 1997)". Heydar Aliyev Heritage - International Online Library. Archived from the original on 2018-05-01. Retrieved 2018-05-01. ^ "Presidential order on Measures to expand partnership relations between the Republic of Azerbaijan and the United States". Ministry of Justice of Azerbaijan - internet database of normative legal acts (in Azerbaijani). Archived from the original on 2018-05-01. Retrieved 2018-05-01. ^ Patterns of Global Terrorism 2002. United States Department of State. April 2003. p. 28. ^ Nasser Sagheb and Masoud Javadi (Winter 1994). "Azerbaijan's "Contract of the Century" Finally Signed with Western Oil Consortium". Azerbaijan International: 26–28, 65. ^ a b "Oil strategy of Azerbaijan". Heydar Aliyev's Heritage Research Center. Retrieved 2019-02-14. ^ "Azeri-Chirag-Deepwater Gunashli | Operations and projects | Caspian". bp.com. Retrieved 2019-02-14. ^ "General historical background of "the Contract of the Century"". Heydar Aliyevs Heritage Research Center. Retrieved 2019-02-14. ^ "History of State Oil Fund of Azerbaijan". State Oil Fund of Azerbaijan. Retrieved 2019-02-14. ^ "Timeline of Baku Tbilisi Ceyhan (BTC)". www.socarmidstream.az. Retrieved 2019-02-14. ^ Presidential Library of Azerbaijan. “Əsrin müqaviləsi”nə gedən yol (PDF). p. 24. ^ a b Presidential Library of Azerbaijan. Economy of Azerbaijan (PDF). p. 24. ^ ""İlkin neftin Rusiya ərazisi vasitəsilə nəqli haqqında sazişlərin imzalanması mərasimində Azərbaycan Respublikasının Prezidenti Heydər Əliyevin nitqi"". Heydar Aliyevs Heritage Research Center. Retrieved 2019-02-14. ^ "Kreml.org | Маршруты транспортировки азербайджанской нефти - источник политических разногласий на международном уровне". www.kreml.org. Retrieved 2019-02-14. ^ "Transport routes of Azerbaijani oil (Baku-Novorossiysk, Baku-Supsa)". www.azerbaijan.az. Retrieved 2019-02-14. ^ Rafael Kandiyoti (2012). Pipelines: Flowing Oil and Crude Politics. p. 165. ISBN 9781848858398. ^ Radio Free Europe Azerbaijan: Ilham Aliev's Confirmation As Premier Will Keep Presidency In The Family. Written by Askold Krushelnycky. Published 4 August 2003. ^ "Dostluk İlişkilerine Katkının Altın Sembolü: Devlet ve Cumhuriyet Nişanları (Turkish) - The Gold Symbol Contribution of Friendly Relations : State and Republic Orders". Haberler.com. February 2013. Retrieved 26 October 2015. ^ "Из беседы Президента Азербайджанской Республики Гейдара Алиева с делегацией Чувашской Республики, возглавляемой Президентом Всечувашского общественно-культурного центра, председателем комиссии по всечувашским национальным премиям имени И.Я.Яковлева, народным писателем, академиком Мишши Юхмой". "Heydar Aliyev Heritage" International Online Library. Retrieved 2019-04-03. ^ "Azərbaycan Prezidenti Heydər Əliyevin Türkiyədə layiq görüldüyü "Dədə Qorqud", "İnsan haqları" mükafatlarının, "İpək yolu" vaqfinin fəxri üzvü diplomunun və mükafatının təqdimetmə mərasimində çıxışı". "Heydar Aliyev Heritage" International Online Library. Retrieved 2019-04-03. ^ "Azerbaijani-French relations". "Heydar Aliyev Heritage" International Online Library. Retrieved 2019-04-03. ^ "Azərbaycan Respublikasının Prezidenti Heydər Əliyevin Ukraynanın Müdafiə Naziri, ordu generalı Aleksandr Kuzmuk və "Qızıl tale" Beynəlxalq Açıq Məşhurluq Reytinqinin Baş direktorluğunun sədri Dmitri Akimov ilə görüşdə söhbəti". "Heydar Aliyev Heritage" International Online Library. Retrieved 2019-04-03. This page was last edited on 18 April 2019, at 20:28 (UTC).